Does Mouthwash Cure Gum Disease? Gum disease is a serious condition, though it starts out almost always silent. Gingivitis, the earliest stages of gum disease that may or may not show symptoms, it is classified by red, swollen gums that may bleed with brushing or flossing. But as it progresses, the infection spreads under the gums and can get into the teeth and jawbone, leading to tooth decay, weakened bones and even tooth loss. Mouthwash is often advertised to help prevent gum disease, and is recommended to use when treating the condition, but can it cure gum disease? When gum disease becomes periodontitis, plaque has hardened into tartar, which cannot be removed with normal brushing. Bacteria has gotten deep under the gum line. While an antimicrobial mouthwash can kill bacteria in the mouth, it cannot get rid of the tartar that is pushing on your gums, allowing more bacteria to hide beneath. In order to completely treat advanced gum disease, a visit to your dentist for a thorough cleaning is required. If necessary, you may be recommended to a periodontitis for treatment. A prescription mouthwash may be given, but it is not the only factor in healing. Treatment for gum disease doesn't end at the dentist or periodontist's office. Good oral hygiene is needed to prevent gum disease from coming back. One of the steps to this prevention is regular brushing. Brushing your teeth at least twice a day can help to remove plaque and bacteria on the surface of your teeth. Flossing is also an integral part of keeping gum disease at bay. Flossing at least once a day removes stuck food particles, plaque and bacteria from between your teeth. Mouthwash, while not the whole solution, is still an important part. Mouthwash, particularly those that are designed to fight bacteria and prevent plaque, should be used both before and after brushing for optimal results. Regular dentist visits are important to detecting gum disease early. This enables you to get treatment right away and prevent it from getting worse. You should visit the dentist at least twice a year. 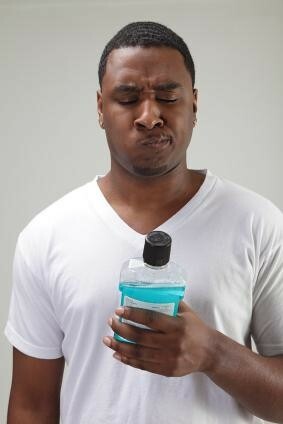 While mouthwash is a crucial part of healing from gum disease treatment, alone it is not a cure. Follow a regular oral hygiene routine and visit your dentist to keep your teeth and gums strong and healthy. Please contact our office if you have any questions about your oral health!